Lovers, I am ashamed to admit this but I’ve somehow let Mothers Day completely slip my mind. In my defence, how is it even May? And because of this short notice I find I’m stuck for ideas. What am I going to get my mum? Sleepwear? Homewares? Or something sartorial even? I’m a girl who prefers to put a lot of thought into another’s gift. Most times it goes unnoticed but not with my mum. She values the little things and is always super grateful for any effort. Be it uber outrageous or something petite. I am also a person who madly attempts to outdo themselves every year. Last year I spent the entire day prior creating a baking spread of magnificence to lay out on her dining table early Sunday morning. I have no idea how I’ll top that one. Maybe a repeat? Though, I’d rather not spend another full day baking. 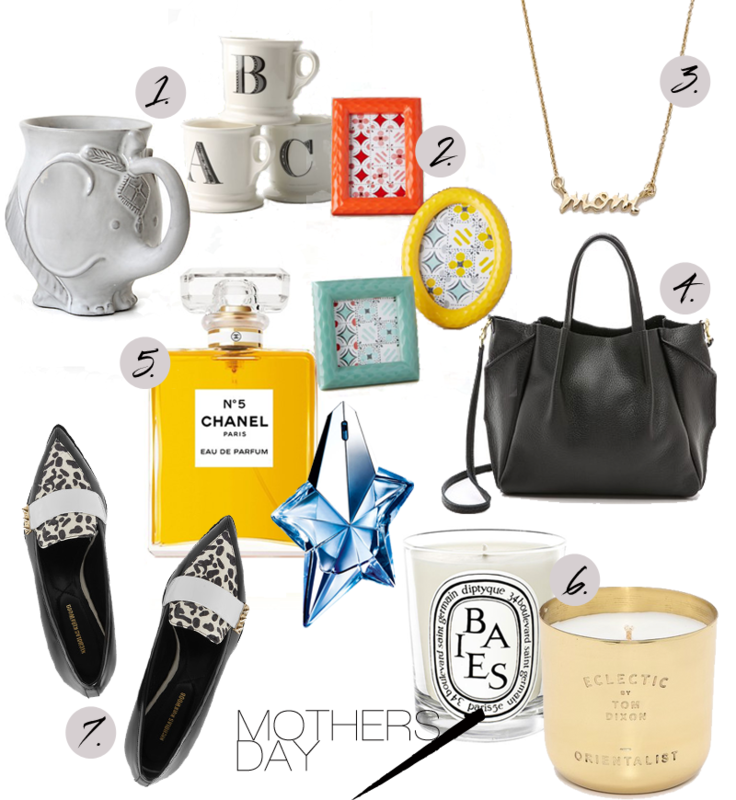 So what have you brought or are thinking of purchasing for your mum? After compiling this edit I’m having a most difficult time deciding what exactly to acquire. All of these peerless finds are singing her name and as much as I’d love to lavish my mum with all this and more, financially my wallet is slapping me about with its crude reality checks. I feel like when it comes to an occasion of this nature, frames are always a good idea; purely for the sentimental value. A chic decorative square with a dear photo of the two of you within it’s glass confines will continually bring a smile to her dial. It’s the gift that keeps on giving. And of course splurging on some classically decadent scents always goes down a treat because who doesn’t find themselves seduced by their opulent designs? Or being encased in those enticingly pampering floral notes? Then there’s coffee mugs. When I was younger I always viewed small and practical gifts like those as lame and unimaginative. These days nothing could excite me more (oh the joys of coming of age). Except for Nicholas Kirkwood. Because shoes. On a side note can I just say how thankful I am to everyone of you for leaving such a splendid array of eloquently expressive remarks on my previous posts (read it them here and here)! I am blown away by the amount of conversation those posts seemingly generated. Never in a million years did I imagine it to garner such a generous amount of attention and discussion. I have adored reading all your opinions, whether you agreed or disagreed or said nothing at all. You’ve reminded me how much I treasure blogging and the exclusive perks of being a blogger. Like having access to such a wonderful support system and the many friendships formed through this medium.